There is a lot that can be said about Switzerland. Socially, it is one of the most diverse countries in Europe and has 4 official languages: German, French, Italian and Romansh. Geographically, it occupies a substantial portion of the Alps and has some of the most beautiful landscapes on Earth as a result. Economically, it has the second highest GDP in the world. Combine these three factors and you have a country with one of the highest qualities of life available and the envy of many other countries. It is expected then that every year that thousands of foreign nationals and businesses look to participate in Switzerland’s wealth and quality of life. This includes many Canadian nationals and Canadian businesses and every year thousands address their affairs in Switzerland. Regardless of your purposes, if you have Canadian documents that need to be used in Switzerland you need to go through a process that will make them valid for use there. Switzerland uses the apostille process of verifying foreign issued documents. This is one of the most popular processes and dozens of countries around the world use it. Therefore it is possible you have been told to get a Canadian apostille for Switzerland. However, Canada does not offer an apostille as it has not signed the Hague apostille convention like many other countries. Prior to the Hague apostille convention, authentication and legalization was the verification process used for foreign issued documents. Canada continues to use this process and it is equivalent and equal to an apostille. Both authentication and legalization take place here in Ottawa. The process focuses on the verification of signatures on Canadian documents. However, these cannot be just any signature, they must belong to an authorized individual. This is often a Canadian lawyer or notary public but also includes the signatories on Canadian vital statistics documents such as birth certificates, marriage certificates, death certificates, and even RCMP police checks issued by the RCMP headquarters in Ottawa. Once your document contains one of these signatures recognized by Global Affairs Canada, their agents can authenticate your document by placing their stamp, seal, and signature which attests the legitimacy of the signature from the authorized person. This seems simple enough but the authentication process can take up to 20 business days to complete. This does not include the time it takes for shipping to and from Global Affairs Canada. There are also a series of additional requirements that need to be met before Global Affairs Canada can authenticate your documents and these vary from document to document. Once your documents have been authenticated then they are ready for legalization at the consular section of the Embassy of Switzerland. The embassy has its own requirements, fees, and processing times for legalization which are subject to change. Due to Switzerland’s high standards, their requirements are very specific and vary on a case by case basis. Specifically, the Canadian documents you will need to legalize for your purposes in Switzerland will have to be confirmed with the embassy. As such, you will have to contact them directly and clarify exactly which Canadian documents you will need authenticated and legalized, and provide proof that they are necessary for use in Switzerland. It is clear that what appears to be a simple process is actually quite difficult. Combined with the fact that delays are common, authentication and legalization can take months to complete without assistance. We saw a need to expedite this process so we founded a company that does exactly that: ALSC. 25 years ago we became the first company to provide this service. Since then, we have helped thousands of professional individuals and businesses process their Canadian documents for international use in over 100 countries including Switzerland. The processes we developed have become the industry standards and we have remained the leaders of our industry since our foundation. We can have your document authenticated the same day it arrives in our office with our priority same day authentication service, saving you up to 20 business days of processing time. We also offer a 3 business day standard authentication service and a 10 business day economy authentication service which save you money and save you time. Although we have no influence over the processing times of foreign embassies, we have built close professional relationships with the consular staff of almost every embassy in Ottawa and dozens more across Canada as well as Global Affairs Canada. This allows us to be up to date on their changing requirements and fees and in some cases know them in advance. This significantly reduces the chance of delays, allows for quick communication, and facilitates the legalization process. In fact, it’s our service guarantee that your documents will be accepted as valid for use in the foreign country of your choice. 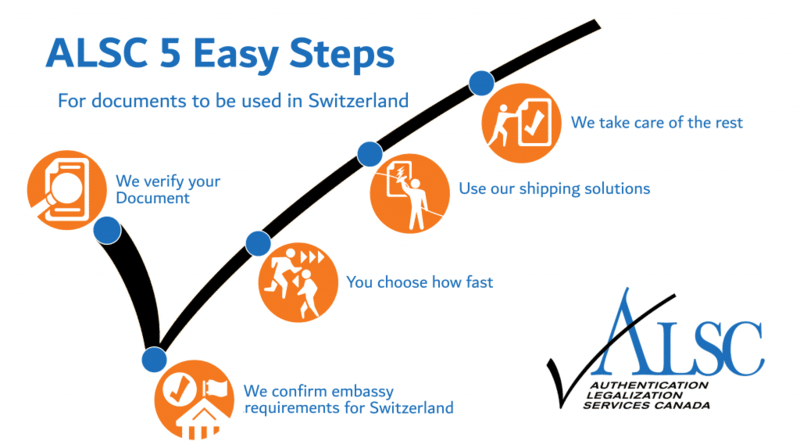 Once you have confirmed use of our services and sent us the documents that the Swiss embassy have instructed you to have authenticated and legalized for use in Switzerland, all you need to do is sit back while we do the work. You will receive updates at every step so you know exactly where your documents are at all times. Our experts will also be available at all times during our office hours to answer any questions or address any concerns you may have. Once your documents have been authenticated and legalized we can ship them anywhere in the world they need to go through one of our many shipping partners. If you have Canadian documents for use in Switzerland and have already confirmed with the embassy which ones you will need, contact us to get started. Feel free to continue reading for more information on Canadian documents commonly used in Switzerland. Canadian vital statistics documents such as birth certificates, marriage certificates, and death certificates are some of the most commonly requested Canadian documents for international use. Although seldom used within Canada, they are often the go-to documents for personal purposes abroad such as citizenship, employment, marriage, inheritance and other estate matters. These documents are issued by the provincial vital statistics department of the province where the life event occurred. The signatures found on these original documents are recognized by Global Affairs Canada which makes them valid for authentication upon issuance. This means that they do not require notarization by a Canadian lawyer or notary public. Notarized copies can be made but are not recommended for two reasons. First, it is usually less expensive to simply order a new copy of your birth certificate, marriage certificate, or death certificate from the appropriate vital statistics office. Second, original documents are always preferred for authentication and legalization. If you have already made a notarized copy, make sure that it will suffice for your purposes in Switzerland. In contrast, another document you may need to use in Switzerland which does require notarization is a Canadian power of attorney. These are often required for matters relating to property. It is possible that a copy of your Canadian passport or other Canadian ID will be required along with your power of attorney for use in Switzerland. If this is the case, simply have a notarized copy made of the appropriate identification document. In the case of passports, usually it is only the picture page that needs to be made into a notarized copy. Make sure to check with the Swiss embassy and your requesting party in Switzerland though, as there are some cases where a complete notarized copy of your Canadian passport will be required for use in Switzerland. If you already have your Canadian birth certificate, marriage certificate, or death certificate for use in Switzerland, check to make sure that they are in the long form versions where applicable. This usually applies to birth certificates which cannot be authenticated by Global Affairs Canada if they are wallet sized. When ordering your new vital statistics document, make sure to check that you have ordered the long form vital statistics document. For birth certificates these may be referred to as a copy of an act of birth or a registration of live birth depending on the issuing province. If you are having difficulty finding your Canadian birth certificate, marriage certificate, death certificate or would simply like to order a new one, refer to the useful links below. Note that you can save yourself time by having the vital statistics document shipped directly to our office if you intend on authenticating and legalizing it for use in Switzerland. Make sure to let us know beforehand if you choose to do this! How to use Canadian Documents in Switzerland: Trust ALSC! Authentication and legalization is unlike many other processes you will have to go through as a person or business. The existence of our company proves that it takes long years of practice to learn the process enough to do it right on the first attempt and with minimal delays. Each attempt takes a lot of time and costs a lot of money which makes it impractical and in many cases impossible to learn. Our agents encounter dozens of people every week who have travelled from across Canada, and in some cases from around the world, to Ottawa just to go through this tedious process. Many attempt to process their Canadian documents on their own and are turned down at Global Affairs Canada or the various embassies for missing easily overlooked requirements and details. To make matters worse, it is often the case that they are not able to gather these missing requirements and provide them within the limited times which Global Affairs Canada and the various consular sections of embassies serve the public. Many of these people turn to us and are surprised to find out just how easy we make it. They are thrilled when we tell them we have over a dozen service centers in cities across Canada including Winnipeg, Toronto, North York, Mississauga, Victoria, Vancouver, Surrey, Halifax, Calgary, Edmonton, Regina, or Montreal. They are even happier when they find out they can receive free shipping to our head office in Ottawa for processing via FedEx upon drop off and free shipping back to any one of our service centers for pick up. In fact, our clients have been so satisfied that we have a perfect 5-star rating on Facebook and Google from dozens of reviews. Our proud membership with the Canadian Chamber of Commerce and our A+ rating with the BBB further prove that we are the best option when it comes to authenticating and legalizing your Canadian documents for global use. Indeed, as our clients can attest, we provide a level of efficient and professional service seldom seen even in other industries. Save time that can be better spent with friends, family, and other business dealings. Trust the experts at ALSC with your Canadian documents for use in Switzerland. We will shoulder the stress, we will spend the time, and we will make your Canadian documents valid for use in Switzerland before you know it. Click below to get started!